Happy Halloween Eve my friends! If you have been following the blog for awhile you may remember me talking about the POPSUGAR Must Have Box a few months ago. I'm so excited to be sharing it again, this time for my favorite month! This was actually the first piece of mail we received in the new house so even Viv was excited & helped me open it. If you're not familiar with the Must Have Boxes, they're a monthly subscription box filled with really awesome curated surprises. One reason I love these boxes over any other is because they're filled with goodies you will actually use. I also love that with every box, you get a pamphlet that tells you exactly what each product is and a little description about it too. Ready for the rundown on what's inside this months box? It's my favorite box yet! 1. Henri Bendel Packable Umbrella - You guys when I opened the box and saw this, I flipped! Henri Bendel is one of my favorites & they always have cute things! I'm a sucker for their jewelry so I am so excited for this umbrella. 3. My Cup of Cocoa Dark Chocolate - Perfect for these cooler months & I love love love it's all natural, non GMO & Gluten free!! Can't wait to top this with some marshmallows! 4. Morning Culture Rise & Shine Mug - The perfect cup to go with the hot chocolate. Love the simple & modern design with a classic logo on this! One of my favorite mugs now! 5. Makeup Eraser Mini - Okay, so have you guys tried these? I have heard of them for years but never got around to actually try them. It is so soft though! I'll keep you guys updated on what I think! 6. 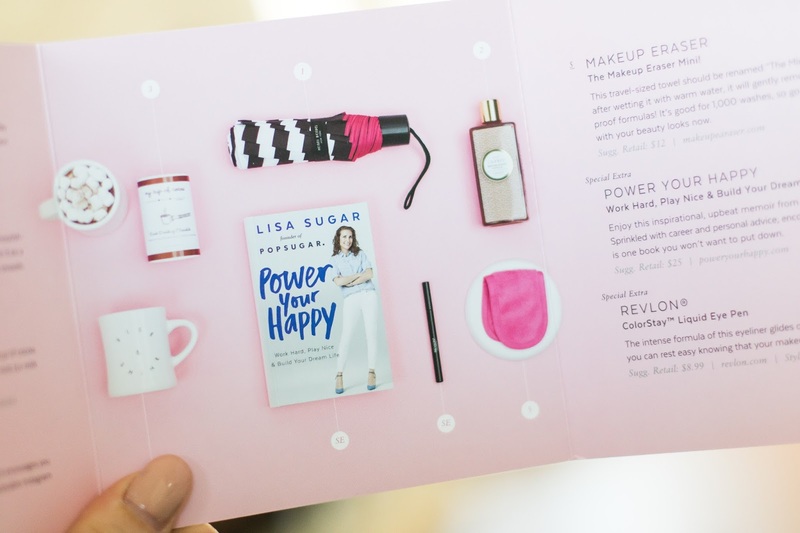 Power Your Happy by Lisa Sugar - I didn't realize at first that the book is by the founder of PopSugar, Lisa, but I can't wait to dig into this. Even the motto on it, "work hard, play nice & build your dream life" is so inspirational. I have a feeling this will speak volumes to me and be one of those books I can't put down. 7. Revlon Color Stay Liquid Eye Pen - I'm all for drugstore eyeliner & mascara y'all. I remember using Revlon in high school and still stand by their products! I can't wait to try this pen though. The end is pretty unique. Its got a ball on the tip to dot and define. Super excited about this! And that's it! I seriously do love that all of the items that come in these boxes can be used by everyone and anyone. They keep the products diverse yet practical, total win. If you want to try one of the PopSugar Must Have Boxes, use the code SHOP5 for $5 off your first box. The code NEVER expires so you have plenty of time if you want a certain month :) Be sure to let me know if you try one of the boxes, I know you will absolutely love them! I hope you all have a fantastic Sunday enjoying all the festiveness for Halloween! This post is sponsored by POPSUGAR; however, all thoughts and opinions expressed are my own.